It’s time for another installment of DIY casino party decor! A while back we provided a number of step-by-step DIY party decor tips that make guests want to go all in at a casino party. There are so many great ideas we just had to share some more of our favorites. Use your vertical space by hanging a few festive banners. We love to add these over the entry way so that guests are immediately put into the casino party spirit the moment they arrive. You can also hang them vertically for a fun backdrop. To create the banner simply punch a hole in the top of each card. Next, get your construction paper and cut out diamonds, hearts, clubs and spades. Make the process easier and more uniform by making one of each shape then using it as a template for the rest. Punch a hole in the top of each card symbol. Now string together the cards and cut outs. That’s all you have to do to create beautiful banners you can hang anywhere. A few poster boards, markers, scissors and a smile can create a seriously great photo op at your casino party. The final effect will look like oversized king and queen cards with the middles cut out so that guests are the centerpieces. Another way to jazz up the entry or a photo backdrop is with a dice and balloon arch. There are two steps to this piece of decor: creating the balloon archway and creating the giant dice. A balloon arch may look complicated, but it’s actually a fairly simple DIY project. Watch this balloon archway video tutorial for instructions on how to do it yourself. You’ll need a lot of balloons, string and stands to make it happen. Now, on to the giant dice. These are perfect for the base of your archway and you can make more to add around the venue in other spots. Get yourself at least four square cardboard boxes. Tape the box up all along the edges for added reinforcement. You can either paint the boxes white all around, let them dry, then paint on black dots, or you can use white poster board and heavy-duty black construction paper to turn the boxes into giant dice. Poker Chip Sugar Cookies: Turn plain sugar cookies into poker chips with a little bit of icing. This is a fantastic idea if you’re hosting a corporate casino party because you can also add your company name or logo in the middle like poker chips from a Vegas casino. Cake Pops With Poker Cards: Cake pops are a fun, festive treat that can be dressed up with a deck of cards. Use a hole punch to make a hole at the top and bottom of a card then slide it on the stick of the baked cake pop. Just make sure to use extra long sticks so that there’s plenty of room for the card and a place to hold onto the pop. 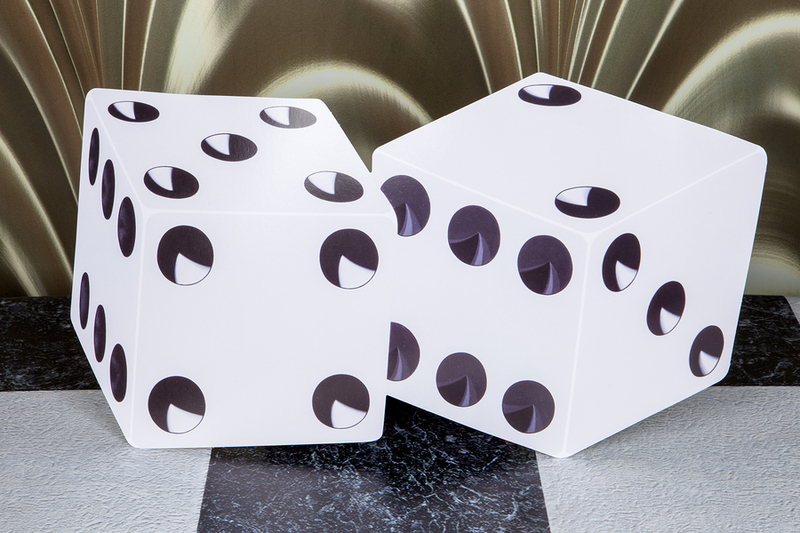 Roll the Dice Brownies or Cake: All you need is white and black icing to create edible dice out of brownies or white cake. (You can also get the same effect with cubes of red or green jello.) Even those who aren’t artistic can easily add a layer of white icing on top and black dollops to make dice in every number. Come on lucky number seven! Need help getting the decor together for your casino party? At Casino Knights Inc. we have all the casino games and decor you need to make guests feel like they’re on the Las Vegas Strip. Give us a call to tell us more about your casino party ideas.